Be Happy (v. 2) – Paul was happy when he talked about Jesus. When you speak about God, Christ and the church… be happy. You’ll never convert anybody by being down in the mouth about and Jesus. It’s called hope for a reason. Be Considerate (v. 3) – Paul complimented Agrippa’s knowledge and asked the King to hear him out. Don’t talk down to people by insulting their intelligence or taking them for granted. Be considerate of their experiences and time. Be Open (vv. 4-18) – Paul’s life was an open book. He talked about his days as a Pharisee, a persecutor, and his conversion. When you talk to people about your hope be open and honest about you were before Christ and how you came to know the truth. They’ll appreciate your honesty and the authenticity of your faith. You’ll win more people to Christ this way because people will see how Christ has transformed you life. Be Obedient (vv. 19-21) – Paul told Agrippa that he had been obedient to the heavenly calling he received from Jesus by preaching to Jews and Gentiles alike. Though we will never have a “heavenly vision” from God we do have his revealed word and we too must be obedient. The old saying is so true, “I would rather see a sermon any day than hear one.” People would rather see your hope and obedience to hear about it any day so be obedient. Be Humble (v. 22a) – Paul said it was by God’s help that he was able to witnesses to the small and great of the world. When someone ask about your hope, let them know it’s not by your strength that you are able resist temptation and follow Christ. Instead, be humble and acknowledge that it’s by the power of God that you are able to resist temptation be a follower of Christ. Be Scriptural (vv. 22b-23) – Paul tells Agrippa that he has only preached those things, which Moses and the prophets had said regarding the Suffering Savior. When you give a defense for your hope lean solely on the teachings of scripture for the truth and reason for what you believe and why you believe it. Your hope is not to be based on what your preacher says, your church believes or you families religious heritage. It is to solely be based on the scriptures. Be Persistent (vv. 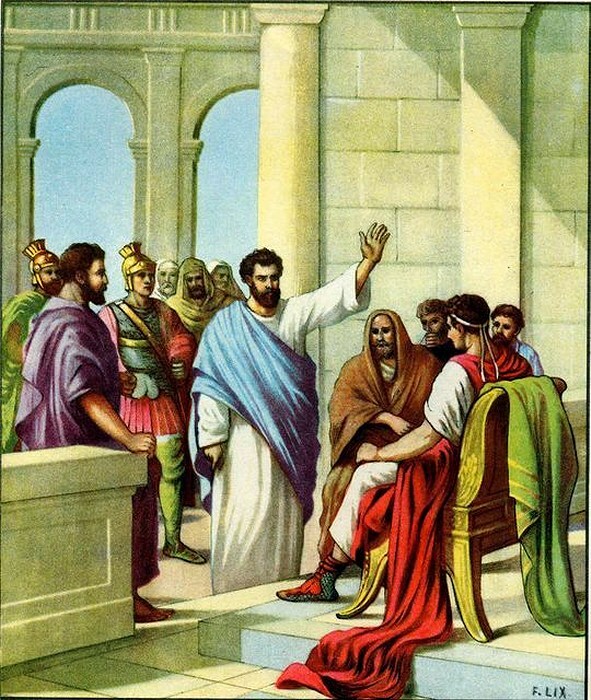 24-29) – As Paul spoke, Festus made a contemptuous remark and Agrippa seemed noncommittal. Nevertheless, Paul was persistent and pleaded with them to obey God and possess the same hope he had. Many times the people who ask about your hope will mock you or put you off but you be persistent, because their souls are at stake.